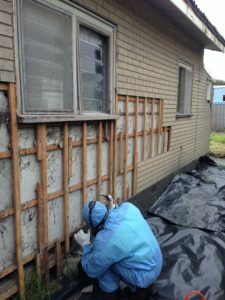 Asbestos Help is a company which excels at providing asbestos removal Melbourne services in Melbourne and surrounding suburbs. Our services include the clean-up, removal and disposal of the asbestos that has been in your property. We are a licensed company which comprises of trained and qualified individuals who know the work that they do very well. They are a dedicated team who work hard to achieve the best results for the clients every single time they are called in for a service. Pick up asbestos debris, waste from your home/place/factory etc. We work with an aim to achieve complete customer satisfaction because we believe that 100% customer satisfaction is the biggest reward any organization can get. We offer effective and proficient services at an affordable. So what are you waiting for give us a call today and let us know about your asbestos problem and we promise the rest is our headache! Trust us and we promise we will not let you down.